The conclusion of the Mueller investigation has created an interesting litmus test that reveals the underlying political biases of the American public. According to a recent poll, 84 percent of Americans want the entire report by Special Counsel Robert Mueller released to the public. They aren’t satisfied just knowing that the investigation into President Trump’s alleged collusion with Russia is over after two years. They aren’t satisfied with the attorney general, a distinguished public servant, explaining the results of the investigation as he is mandated to do by law. No, they want to see the report for themselves … they want to go over it with the proverbial fine-tooth comb and hunt down every inconsistency, every missing comma, every hidden clue that what they already know to be true is indeed true — that they can’t trust the government, that the wool is being pulled over our eyes, that the system serves some ulterior purpose and works on behalf of someone or some group that is not us. That is a horrid condition for the body politic to find itself in. It suggests a complete lack of confidence in our leaders, in our institutions, even in our Constitution. But it is even worse news for the Democrats who are leading the charge to see the “full” report because for them it also reveals a deep underlying hypocrisy. Democrats, after all, are the party of big government. The basis of their entire theory of human liberty and advancement is that we can count on the government for anything, that it is the answer to all our problems. What the demand for transparency means at its core, however, is that we don’t trust government. There are good reasons why that is true, starting with (for many of us) the JFK assassination, but in fact there is no such thing as 100 percent transparency. You cannot look into the soul of the attorney general or the president and certainly not the soul of the soulless bureaucracy that ultimately runs our government. So when the Democratic leaders of Congress say they don’t trust Attorney General William Barr to tell the truth about a report that he is about to make public, they not only defy logic; they defy the very philosophy of the Democratic Party. But Democrats take the opposite tack. They believe as a matter of faith that we the people should put our entire faith in the government, and therefore the party’s full-court press against the Trump administration by definition undermines their own philosophy. They are in fact teaching people to distrust government even more than they already do. Thus, when Nancy Pelosi said last week that she doesn’t trust the attorney general, she is ultimately weakening the Democratic case for turning health care, student loan debt, education or anything else over to the feds. If our chief law enforcement officer can’t be trusted, who can be? Barr got Pelosi’s goat Wednesday morning when he testified before a Senate committee that he believes “spying did occur” against the Trump campaign in 2016 by elements of the U.S. intelligence apparatus. To those of us who fall on the red side of the Mueller litmus test, that is an obvious conclusion — as obvious as that it’s laurel, not yanny, in the famous internet audio clip. But to Pelosi, hearing Barr state plainly that he thinks Obama-era spooks were haunting the Trump campaign is automatically translated into the equivalent of “yanny” — namely, that Barr is either an agent of Russia or that he is obstructing justice on behalf of his puppet master Donald J. Trump. No, what undermines our Constitution and our government is people like Nancy Pelosi questioning the motives and honor of good people who have chosen public service as a higher calling while at the same time she tirelessly defends James Comey, John Brennan and James Clapper, who appear to have used their plenary powers to intervene in 2016 and either prevent or subvert the election of Donald Trump. Barr has said he will get to the bottom of what happened — that he will launch an investigation into how the government decided to spy on Trump’s campaign. 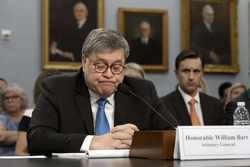 As Barr said, “spying on a political campaign is a big deal.” That should not be a partisan issue, but based on the liberal heads exploding Wednesday afternoon, it sadly is. You say yanny, but I say laurel. If it’s fair for Speaker Pelosi to question the motives of Attorney General Barr, then it’s certainly fair for me to question the motives of former FBI Director Comey and his cohorts at the bureau and in the Justice Department. We already know we can’t trust our government, so let’s do the next best thing. Let’s find out who lied to us — when, why and about what. Nancy Pelosi should not be able to stop that. No one should.